Read this post to learn about Sign Language Blitz founder, Christopher Morrison! What made you want to start Sign Language Blitz? There are three big reasons why I started Sign Language Blitz. First and foremost I want to give back. Sign Language Blitz [allows me to use] my talents in software engineering to realize this. The second reason is that I’m an entrepreneur. I consider an entrepreneur to be someone who sees a way to make life easier or grander and is impulsively drawn to making that solution. The final reason I started Sign Language Blitz was to work on something I was passionate about and still be able to work part time on my research pursuits. What’s your goal for SLB? The vision of Sign Language Blitz is to help friends and family of the Deaf community learn ASL. I will consider it a success if it only helps me learn ASL, but I hope it will be a valuable tool for a lot of people. Is Sign Language Blitz your full time job? About a year ago, I took a job at a start up company in Seattle called USNC. I spend a few hours in the morning working on Sign Language Blitz followed by a work day at USNC. I do enjoy my “day job” as I’ve been able to work on nuclear energy for NASA and use my knowledge from my studies to look at space exploration. 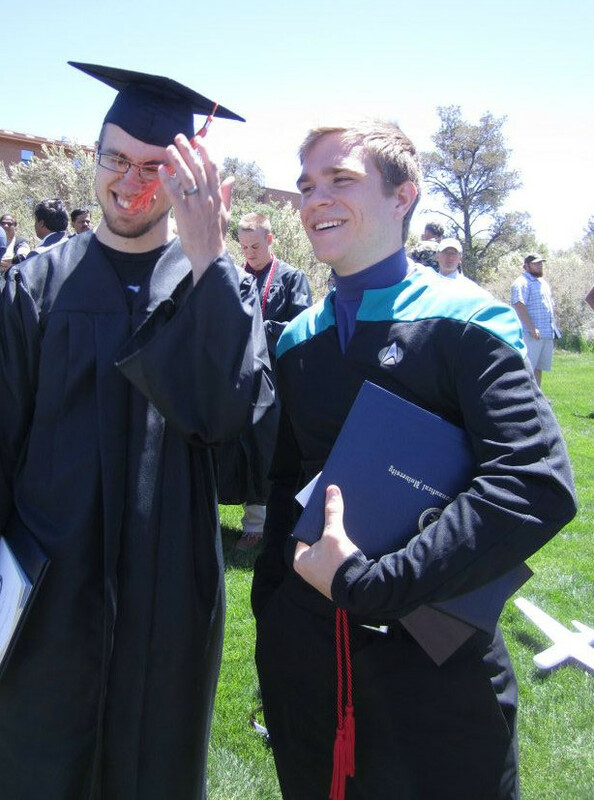 Chris wearing a Star Trek uniform under his graduation robes after finishing his B.S. at Embry Riddle Aeronautical University in 2012. Tell us about bit about yourself. Where are you from? Where did you start and how did you get to where you are now? I grew up in Albuquerque in the suburb of Rio Rancho. A series of great middle school and high school teachers challenged me; I owe a lot to the public education system. I felt very well prepared when I got to college and grateful that I didn’t have to take a lot of the entry level classes. I wrote in many of my college essays that “making space humanity’s backyard” was my career goal, and decided to major in Aerospace Engineering at Embry Riddle Aeronautical University. I wanted to work on something that was critical for space but where very few people were working. Long story short, I emailed an astronaut Dr. Franklin Chang Díaz and he helped me to choose nuclear power for space applications. I was lucky enough to find a Ph.D. advisor, Dr. Ji, at Rensselaer Polytechnic Institute who was agreeable to my research interests and headed to graduate school. 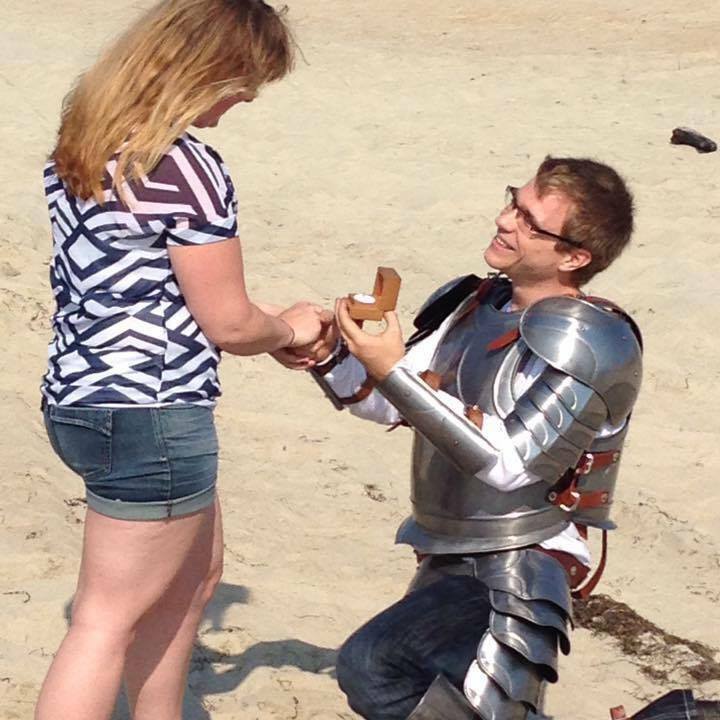 Chris’ proposal in June of 2015 included a horse, a suit of armor and most importantly the perfect princess. Outside of rocket science and entrepreneurship, do you have any hobbies? My dad’s side of the family loves to fish. In the winter we’d ice fish and in the summer sometimes we’d go out in a boat. As a kid I usually got my line tangled on a tree and lose interest, but now that I’m older I don’t mind spending long hours on the ice as long as I have someone to share it with. In high school I’d invite friends and cousins over for LAN parties. Everyone would bring a TV, ethernet cables, laptops, board games, etc. Whenever I’m back in Albuquerque I still have late night LAN parties playing the same games with the same good friends. My wife and I just signed up for a Tough Mudder in September here in Seattle. Being more physically active is kind of new to me. In the last few years, I’ve gotten into hot power yoga. It sounds crazy to be in a hot humid room exercising, but I really enjoy the strength, flexibility and most of all mental benefits. What does the team look like? What is your role? First I’d like to say that the team for Sign Language Blitz is what really makes it work. The team right now is composed of four people. I have the dual role of the programmer and user. I handle the technical stuff as the programmer and I as the user I give feedback on if what we are doing is actually helping me learn ASL. Mabel plays a critical role as Lead ASL Instructor at Sign Language Blitz. she is adept at managing the creation of new content in our lessons. Liana is the marketing genius. She also designed our logo. Gerald makes videos for our lessons; if you use our platform you’ll be seeing a lot of him. Gerald also [signs our] social media posts. Our team also includes two dogs. Mabel’s and Liana’s canine friends typically join our video calls. Clementine and Cleopatra provide the cute factor and sometimes comic relief. I couldn’t be happier with the team, everyone is doing a great job and we are all focused on doing it right. Good question. I would like to think that it is a combination of technology and our teaching focus. Our teaching focus is on useful conversation. Our goal is to introduce the user to phrases rather than vocabulary. Our videos are focused on expressing an idea in the form of a phrase. This helps the users to be more conversational and more comfortable with going to social events [using] ASL. This makes us much different than the other platforms that are typically focused on words. Technology is the second area where we excel. I could get really technical here, but it suffices to say technology is improving and we have the ability to keep up with it. What’s happening for the company in the near future? We have a lot in store over the next few months. We are releasing our demo at the beginning of August, where you can try the Blitz Card platform. It has a tutorial and will focus on a single lesson. In August we will be asking anyone who is interested to try the demo and give us feedback on what they liked and didn’t like. By September we aim to release the open beta. The beta allow users to sign up and study more than one lesson. We’re not sure how long the beta will last, but we will release the final product after we work out any bugs in the beta. We don’t know the final price of our software yet, but currently we are thinking it will be a monthly subscription for about the cost of a cup of a latte per month. It is an exciting time for us.